Bahama Buck’s provides an informative summary on their webs ite of average gross sales along with average percentage costs. I wish all franchisors provided more transparency likes this. I do believe it would benefit the franchisor and speed up the sales process. You wouldn’t buy a stock security on a U.S. exchange without financial disclosures, would you? …and gaining. 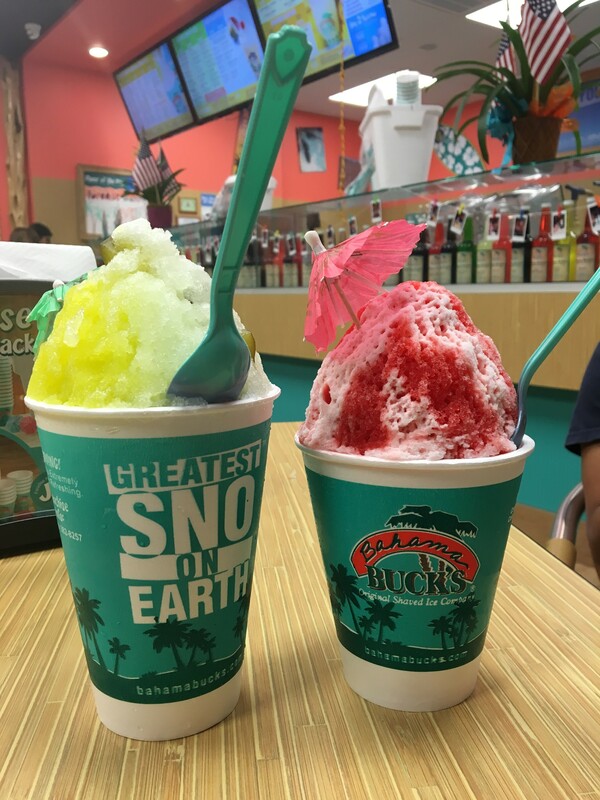 Despite a sluggish economy, Bahama Buck’s average store sales have increased 101.95% since 2008. We’ve got something people crave and we’re the absolute best at it. Impressed? So are our competitors. Simple, focused inventory allows us to enjoy the lowest food and paper cost in the industry. Now that’s impressive. Dare to compare. Clearly one of the highest profit margins in the frozen dessert industry. In fact, it’s nearly twice as high as the QSR industry. Please Note: The averages are based on a 52-week annual period from January through December 2016 as published in Item 19 of our 2017 Federal Disclosure Document. Average Unit Sales Volume for stores in the top 25% is $621,736; stores in the top 50% is $537,410; stores in the top 75% is $481,202; and all stores combined is $424,170. *The audited corporate locations do not pay the 6% Royalty Fee, but the value has been included in the expenses to reach the posted 21.13% average net profit (Corporate locations average net profit were 27.13%). Other financial performance representations are contained in Item 19 of the Franchise Disclosure Document. A new franchisee’s results may differ from the above represented performance. There is no assurance that you will do as well and you must accept that risk. Top your own pizza prepared “Chipotle Style” is a great concept and is hear to stay. However, Pie Five, a big player in the space from RAVE Restaurant Group (formerly named Pizza Inn), is having trouble. Two locations in Colorado Springs closed within a year of opening. Franchisees closed locations in Chicago and Minnesota, too. The franchisor closed 10% of its company-owned stores this year. The lower-than-expected sales and repeat visits were blamed on the brand and store design, with franchisees claiming it was tough to stand out in a crowded pizza market. They also accused the franchisor of misrepresenting sales numbers. …the suit claims Pie Five’s food supplier, Performance Food Group, doesn’t provide fair pricing to franchisees. According to NRN, Pie Five collects a 2.5 percent rebate on food that Performance sells to its franchisees. Ouch! That adds up when you are barely breaking even and you can’t reduce your food costs. Frankly, I’m a bit surprised at Pie Five. They started off strong. The store style was nice and modern, but the final pizza quality was lacking. Just about everyone I knew that ate there said is no better than “average” with somewhat dry crust, and that won’t inspire repeat visits or groups spending $8 a person for pizza. With foodies experiencing hand-crafted Neapolitan style pizza using the delicate ’00’ flour, you gotta up your game Pie Five. Blaze Pizza has the makings of a winner in this category, excellent product and excellent dough, despite the baking method that depends on an attentive pizza attendant with long peel. 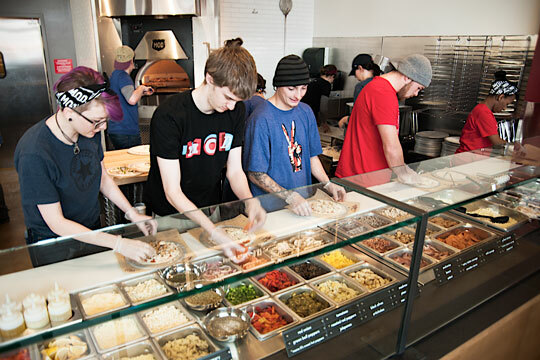 A franchisee is planning to open 25 Mod Pizza locations in Colorado over the next few years. This segment has been growing rapidly, with contenders Blaze Pizza from Wetzel Pretzel founders and Pie 5 from Pizza Inn corporate. I’ve tried them all and Blaze Pizza does have the best tasting and textured dough. Blaze bakes pizza in a Woodstone oven which gives it a different taste profile from the conveyor belt bakes from Pie 5. It is less efficient in the Woodstone oven, and consistency does suffer when 15 seconds can make the pizza go from perfect to burnt, but the vast majority turn out well baked. Any of the concepts are a safe bet at this point. Expansion through delivery, especially through services like Uber Eats, will help this business model. I’d buy it! updated Sept 29, 2016: GameStop’s stock price increased 24% since July 2009, Nasdaq is up 225%, S&P 500 is up 136%. I’m sure the stock performance of GameStop somewhat tracked the performance of retail gaming chains. Recent earnings calls list new and used game sales down a little less than 10%. Downloading games directly and RedBox certainly has weighed on its earnings and risk. The “I wouldn’t buy it” for the industry is still my opinion after 7 years. GameStop spokesman Chris Olivera declined to comment specifically on Best Buy’s test, but he indicated GameStop’s more than 6,000 stores have advantages over self-service ventures.”Trading in used games and consoles is a highly-assisted activity,” Olivera said in an emailed statement. “We are very confident in our model that allows for our expert associates to help consumers trade in product, a fact not addressed with a self-serve process.””Likewise, GameStop has over 12 years of skin in the game and understands the highly-regulated business of pawn and resale laws that vary not only from state-to-state, but municipality to municipality,” he added. Young kids have been self-trained to research and buy online for the best price. I wouldn’t bet on kids paying a premium for simple trade-in transaction. Sorry Play N’ Trade and Game Stop. One angle these speciality stores could still exploit is providing its customers with in-store use of expensive assets, particularly renting by the hour very high-end immersion and 3-d gaming equipment. Panera Bread had its origin in St. Louis in 1987 where it is still called St. Louis Bread Company. Tim Horton’s, a fast service coffee and donuts shop with limited sandwiches, doesn’t care about the heritage and is planning to open 40 units in St. Louis and pushing more out nationwide through franchising. There have been mixed reviews stemming much from low brand recognition in a crowded market. I as a consumer look forward to more good fast morning options. Some of Wendy’s initiatives seem to actually be working. They have modernized their design and led a good marketing campaign around the pretzel bacon burger. I’d be feeling better if I was a franchisee. Wendy’s (WEN) says company-owned same-store sales increased 3.2% in North America during Q3 and franchise-owned stores improved 3.1%. The two-year stack for same-store sales was 5.9% to mark the best growth since 2005. Company-operated North America restaurant margin was 15.6 percent, compared to 13.9 percent last year. The margin improvement was due to a favorable sales mix, with lower paper and beverage costs, partly offset by a 100 basis-point increase in commodity costs. The Company is offering an incentive program to qualified franchisees commencing Image Activation restaurant reimages during 2013. About 100 of these restaurants are currently in various stages of active process, and the Company believes most of them will be open or under construction by the end of 2013. In addition to the expected 2013 increase in Image Activation new builds and reimages, the Company continues to expect further acceleration in Image Activation reimages for both Company-operated and franchise restaurants during 2014. Seattle’s Best is opening 10 small (roughly 500 square feet) combination drive thru and walk up with no indoor seating. The drive thru makes all the sense in the world, and I’ve seen the success Starbucks has had with it. But, the walk up window is a little iffy because you will lose all retail opportunity (beans, coffee related equipment, music, etc.). Hello READERS! Sorry for the downtime. I had a new baby and ignored this site for a few months. I am updating some technology so the site will be a bit bare for a few days. Things will be back to normal by Monday. Thanks for your patience. Dallas-based Romano’s Macaroni Grill (a Brinker Intl restaurant) is buying four locations from a bankrupt franchisee. The locations are in San Francisco Bay (3) and Seattle (1). The parent company now owns all but five of its 200+ Romano’s Macaroni Grill restaurants. There has been a movement of public companies selling corporate owned units to franchisees, but now I’m seeing more examples of franchisors acquire units from franchisees. The reason is probably driven mostly by low valuations of the acquired businesses. Today I rented online and watched the movie Act of Valor ($4 on Amazon Instant Video or iTunes). I was humbled and proud to watch the preparation and risks these Navy SEAL heroes take to protect our country. The movie put me in the right frame of mind to reflect on my own priorities and work to eliminate the unnecessary complications in life. Wise words that I plan to keep close to my heart. Papa Johns is again offering incentives to new franchisees this year. This looks to be the same as last year. There are tight timing issues with opening to hit the incentives qualificaitons. A $3,000 food credit with PJ Food Service, which operates Papa John’s fresh dough and food distribution quality control centers, for each restaurant that opens at least 30 days prior to the scheduled opening date. I am sorry about the days of downtime. It is now fixed! Imagine you have the perfect location for your franchise near a stadium with lots of pedestrian traffic. You spend $450,000 to get your first franchise built and ready. Opening week was wonderful with sales of $12,000 and subsequents weeks continue on with profits. Then, a major light rail construction project starts out front and blocks your sidewalk. After a few weeks of jack hammers and tarps blocking views, nobody is venturing down your way because they don’t want to deal with the noise and nuisance. The construction project lasts for 8 months. A similar story has happened in Minneapolis, MN in an area called “Stadium Village” near Target Field. Quiznos couldn’t afford to stay open. Independent fast food places such as Hot Diggity Dog and Leo’s Burritos also shut down with no word whether they will reopen. This is a really unfortunate and sad situation. These projects are often years in the making so perhaps the franchisee should have anticipated this development. Nevertheless, with strict operating rules in a franchise agreement there is not much the franchisee can do to adjust operations. For someone who really has a passion for managing a process, though, investing in franchises can be so lucrative that that extra spark [entrepreneurship] may not matter. I’ve heard several franchisors speak at the National Restaurant Association conferences and have worked with others as their attorney, and some failure and poor sales is attributed to failure to “follow the system”. I’m sure the franchisees would disagree, but I believe there is on some level truth in this failure to “follow the system” particularly in regards to marketing/sampling, cleaning and training. “Following the system” is a little misleading though, because most of the franchisees technically are following the book, but the passionate and efficient execution is not there by the franchisee and their staff. Are the work areas and customer areas always clean even if you are following the operation manual’s cleaning schedule of “every 20 minutes walk through” of the dining area? Is the customer service respectful and prompt? Is the quality of product or service at least meeting the expectations of the customer? Is security monitored and threatening enough to ensure customers and staff are not stealing? I would also add that franchisees need to be leaders. They must be able to handle the moment in front of customers and employees, run effective meetings, and be articulate motivators that can instill at least mild passion in staff to do the right thing. If you are meek and weak, you will be taken advantage of. But, don’t worry, it’s not you, it’s like that throughout the animal kingdom. But you probably shouldn’t be a franchisee. Entrepreneurship requires the above traits as well. But, innovation is the element a franchisee is not empowered to really drive (it’s controlled by the franchisor), BUT an entrepreneur is required to drive innovation to survive. Are you a franchisee thinking about how to best fund college for your children? Your research will quickly lead you to 529 plans, and in my opinion and experience as a purchaser it is probably the best option for college savings. You will also hear about Coverdale Education Savings Accounts but for tax complications and low investment levels it is probably more trouble than it is worth. Individuals subject to Illinois state income tax can deduct from their taxable income up to a maximum of $10,000 per year for contributions made toward the purchase of any College Illinois! Prepaid Tuition Program contract. * Married couples filing jointly can deduct up to $20,000 per year. ** This state tax deduction reduces the individuals’ adjusted gross income (AGI) by the amount contributed up to $10,000 (or $20,000 for those filing jointly). Contributions are included in the annual $13,000 exclusion from federal gift taxes for gifts made to any one person. But, unique to 529 plans, a contributor can give up to five times that amount ($65,000) in one year and treat that contribution as if it were made over five years for gift-tax purposes. You’ll have to do the math to see if the tax savings in the long run outweighs the higher fees of your state’s 529 plan. A benchmark to use is New York’s direct sold 529 plan which imposes a combined annual fee of .17% starting in March 2012, the lowest of any state right now. Investment options include a diverse and respectable range of Vanguard funds. I have previously recommended and have purchased myself 529 prepaid tuition plans, whereby a parent prepays tuition at todays value to protect against tuition inflation that has historically been over 5%. The state prepaid plans generally have provision to pay out-of-state and private schools the same future value of the tuition. The state-sponsored prepaid college tuition programs were supposed to shift the investment risk from families to the government. But, many states now are struggling to make investment returns that keep up with annual increases in tuition and shortfalls are causing plans to turn into a Ponzi scheme. Some state bolster the appearance of safety like Florida who backs their plan with the full faith and credit of the state. Nevertheless, the program managers can and are starting to change the payout rules. You’ll have to research it. I would only use a prepaid plan in combination with a 529 savings plan which YOU entirely control. My main goal of this article was to provide some advice based on my experiences purchasing these plans over the years. The recent development of the New York state 529 plan offering a .17% total fee is so enticing I had to share it with readers. I’d like to respond to a some emails by adding perspective to this blog college, tuition, savings and jobs. Peter Thiel, co-founder PayPal, hedge fund manager, early investor in many startups including Facebook. Mark Cuban, co-founder of Broadcast.com acquired by Yahoo! for $5.9 billion, owns NBA’s Dallas Mavericks, Landmark Theatres, and Magnolia Pictures, and HDNet. Their premise is that college degrees at expensive universities are a pseudo-scam. Students assume they can “flip” their degrees into a higher paying, more likeable job. So students in college trade 4 to 5 years of income, business experience, and pay for housing and room and board for a 50+% unemployment and underemployment rate. At many private schools the total combined investment can be over $75,000 per year. Another side issues is if you sacrifice and save money for your kid’s college, the schools and government punish you because you have too many assets or income for need based tuition support. The nobility usually associated with saving for college is eroded after considering some of these issues. As a parent, it is a difficult personal decision to allocate your extra cash to college savings for you kids, new business ventures, or retirement savings.